Most people think of Malaga—the dense capital city of Spain’s identically named province—as merely a beach destination in the heart of the famous Costa del Sol, a long spread of Mediterranean sand where Europeans gleefully vacation. But what those weekenders fail to discover are the incredible natural parks that fill the region with rich wildlife. Because it sits between the subtropical Mediterranean climate along the coast, mountain ranges to the North and varying temperatures farther inland, the Malaga province boasts endlessly fascinating animals and plant life you can’t find anywhere else in the world. As a furniture designer and woodworker, trees have a special significance to me. They’re both a professional material and a source of personal inspiration. If a tree can live and thrive in the wild for hundreds of years, so too should the furniture it is made from in your home. It was this love of nature that inspired us, two years ago, to explore this Andalusian region by seeking out its most ancient trees. At first we had trouble finding information about them. Although they are designated natural monuments by the local government, they are not typical tourist destinations, and are frequently located well off the marked trails. Poor signposting frequently delayed our travels, but the true experience is in the journey, and escaping the crowds is well worth the minor inconvenience. Luckily we enjoy a good hike, and our dear Haya—our adopted Andalusian hound puppy, whom we named the Spanish word for Beech because her coat is a similar colour to the reliable European hardwood—proved a more than willing companion. The first tree we visited was the Millennial Olive of Arroyo Carnicero, located just north of Malaga city near Casabermeja. Southern Spain is filled with olive groves, with an estimated 170 million trees dominating its cultivated landscape, and producing nearly half of the world’s olives and olive oil. The humble grove that is home to the Millennial Olive of Arroyo Carnicero is marked by a small wooden sign that is easy to miss; but as you approach it, it’s immediately evident which tree won the “Best Monumental Olive Tree” award in 2013 by the Spanish Association of Olive Municipalities. 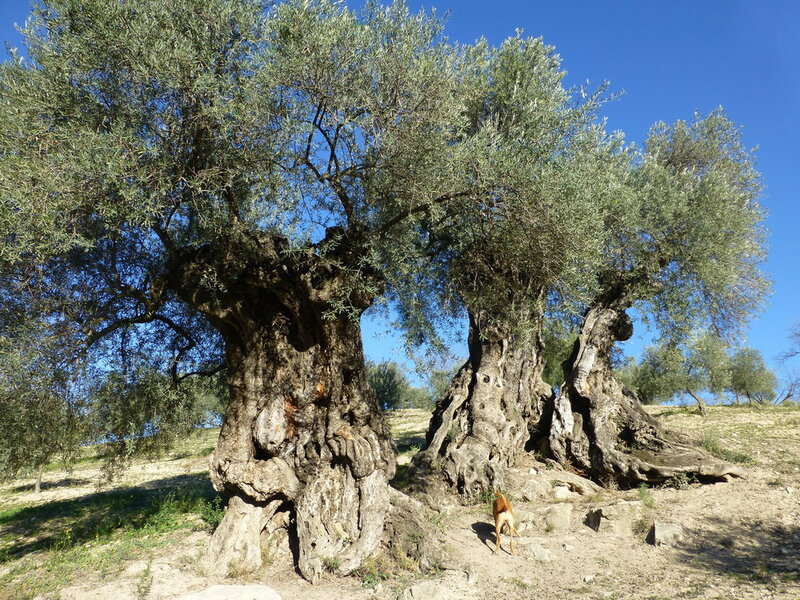 The Millennial Olive of Arroyo Carnicero is more than 1,000 years old, some researchers believe. The enormous tree stands apart from its neighbours by sheer size and character, being composed of three twisted trunks that share a common root buried by hundreds of years of soil. Incredibly, the tree still produces edible olives, although you can only harvest them by hand, rather than by shaking the trunk over a net. Haya helped herself gladly to a few of the millennial olives scattered around the tree. Researchers have estimated that the Millennial Olive of Arroyo Carnicero is over 1,000 years old, which is easy to believe considering the region has been cultivating olives since its Phoenician origins. Olives play a large role in the way of life here in Spain—olive oil, bread and wine are the three staple foods that form the basis of the Mediterranean diet. Olive trees thrive in Malaga and Andalusia because they need hot, sunny weather and are resistant to drought. They are known for their longevity, but because of their gnarled shape and slow growth, they aren’t much use after they reach the end of their lifecycle. Most of them end up warming the homes of locals from their fireplaces. This majestic, ancient tree before us could live another 1,000 years, but ultimately, it will likely meet the same fate as the others. Nearly a year later, we ventured further west to the small town of Istan. 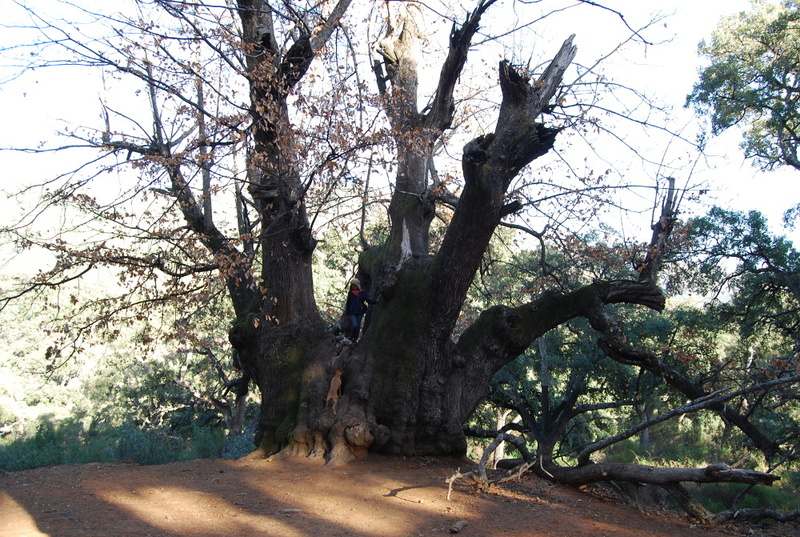 There, up in the mountains of the Sierra de las Nieves (Snow Mountains) lies the Holy Chestnut Tree of Istan. The best way to access the tree is to hike through the forest or along the mountain path called Puerta Verde de Marbella (Green Gate of Marbella), as the rocky mountain track is not suitable for most cars. We found this out the hard way, driving over jagged rocks above steep cliffs, forced to continue as there was no way to turn around. At least the view was spectacular. Eventually we arrived and made our way into the forest toward the tree. Along the way we saw many pines, cork and holm oak trees, as well as other chestnut and almond trees. Although we didn’t see any during our short visit, it’s also possible to see wild pigs feasting on acorns and nuts. Haya wasn’t so lucky, as chestnuts weren’t in season when we visited, but she took in all the smells as she climbed up and down the mountains. The Holy Chestnut Tree of Istan, with a perimeter of 13 metres, is named after a battle prayer held before it in 1501. Although there is no plaque or information nearby, the tree is unmistakable, with its enormous 13-metre-perimeter trunk. If you aren’t too tired from the hike, you can hop up on the trunk itself since it isn’t particularly tall. Due to erosion, some large stone retaining walls have been built on the south side of the tree, which is fortunate considering it is located on private, unprotected land. Aged somewhere between 800 and 1,000 years old, the tree gets its name from a prayer held there by Catholic monarch Ferdinand II in 1501 during an expedition to squash a rebellion in Marbella. Even then, the tree must have already been an impressive sight. Ferdinand, along with his wife Isabella I of Castile, had sponsored Christopher Columbus on his journey to America less than a decade earlier. A hundred years earlier, the region was one of the last strongholds of Al-Andalus, a medieval Moorish territory that once covered nearly all of the Iberian peninsula. We sat near the gnarled base of the tree, reflecting on the changes it had seen during its lifetime, and wondering how many more it may see. It was truly a humbling experience. 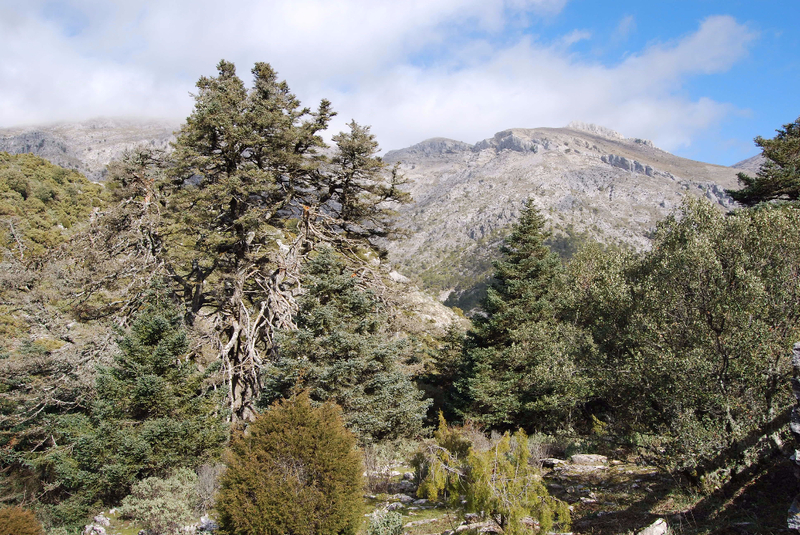 Also in the Sierra de las Nieves is the Escalereta Spanish Fir, the largest and oldest tree of its type in existence. Native only to Southern Spain and Northern Morocco, the Spanish Fir (Pinsapo) is quite rare, and part of Sierra de las Nieves is designated as a biosphere reserve for its conservation. Spanish fir trees feature long cylindrical leaves with thick, sharp needles and seed cones at their tips. They are prized as ornamental trees, and can be seen in various botanical gardens around the world. The park itself is beautiful and there are many hiking paths and recreational areas, but this particular tree is located on its own trail in the southern part. Driving through the park to the start of the trail, we were briefly delayed by a herd of sheep crossing the road, much to the delight of Haya in the back of the car. The plaque identifying the Escalereta Spanish Fir is weathered and hard to read, but the tree itself is unmistakable. The trail to the Escalereta Spanish Fir feels more like a wild forest than the one to the Holy Chestnut Tree of Istan, but it isn’t so dense as to impede travel. Again, the tree is poorly signposted, although near the tree there is a stand for a plaque that likely contains information about the history of the tree—we couldn’t tell because the plaque was weathered and illegible. But the tree itself is easily distinguished, as it towers above the others at 26 metres. The government hasn’t had the budget to accurately date it yet, but it is estimated to be between 350 and 550 years old, well beyond the expected 200-year lifespan of its species. 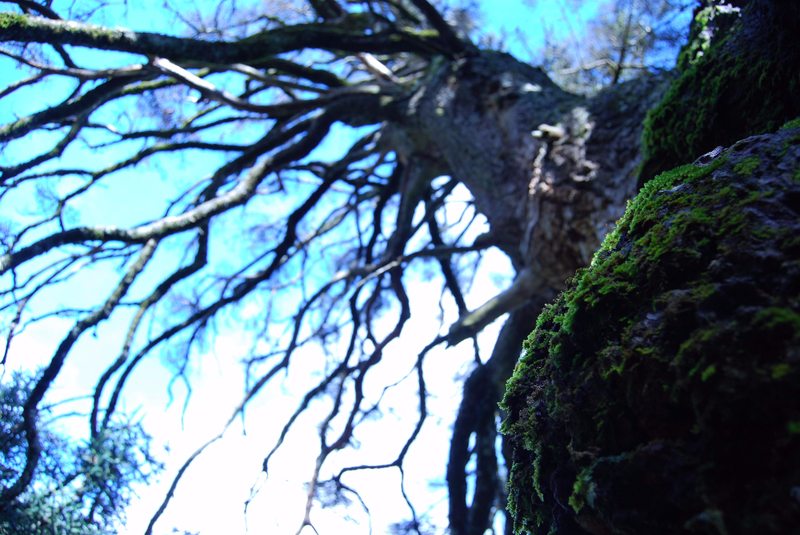 We ventured down toward the base of the tree, climbing over fallen branches and mossy boulders. Tucked away in the undergrowth is a five-metre-diameter trunk, shooting upward and splitting into branches larger than many of the surrounding trees. From here you can see the character that time has imbued on the tree. Long too heavy to grow straight into the sky as most of its species, it has grown outward diagonally on three thick, knotty trunks. It’s well into its final life stages, and will likely soon fall to decay, much like its own commemorative plaque. But there’s reason for optimism. Although still listed as a vulnerable species, careful forestry management has more than quadrupled the number of hectares of Spanish fir trees in recent years. There are several centennial trees on the trail of the Escalereta Spanish Fir, and hopefully that number continues to grow. It is a reminder that we cannot take these trees for granted—there are countless stories and histories tied to living nature that will likely be forgotten when these trees fall. Because they will fall, one day. But if we’re mindful now, we can appreciate them while they’re here, at least, and look forward to celebrating new landmarks in the future. Nick Rowan is a furniture designer and maker based in Malaga, Spain. With his wife, Sachi Serrano, he is a co-founder of La Diseñoteca, a furniture and interiors firm. He has lived all over the world, from Tokyo to Edinburgh, and likes to search for unique experiences that each new place can offer.